Nissan today unveiled the world’s first steering technology that allows independent control of a vehicle’s tire angle and steering inputs. 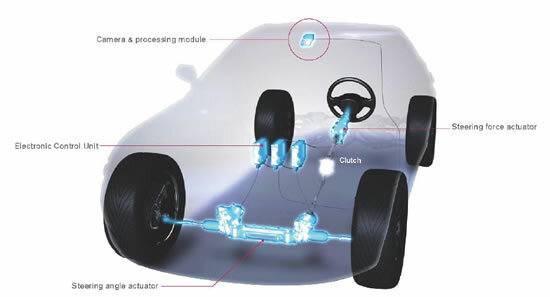 A conventional steering system directs tire movements by transmitting steering inputs to the tires via a mechanical link. Nissan’s next-generation steering technology reads the driver’s intentions from steering inputs and controls the vehicle’s tire movements via electronic signals. This transmits the driver’s intentions to the wheels even faster than a mechanical system and increases the direct driving performance feel by quickly and intelligently communicating road surface feedback to the driver. This next-generation steering technology’s high reliability is achieved by multiple ECUs. In the event a single ECU malfunctions, another ECU will instantly take control, and in extreme circumstances such as the power supply being disrupted, the backup clutch will act to connect the steering wheel and wheels mechanically, ensuring continued safe travel.The system controls and insulates the vehicle from unnecessary road-generated disturbances to deliver only the necessary performance feel to the driver. 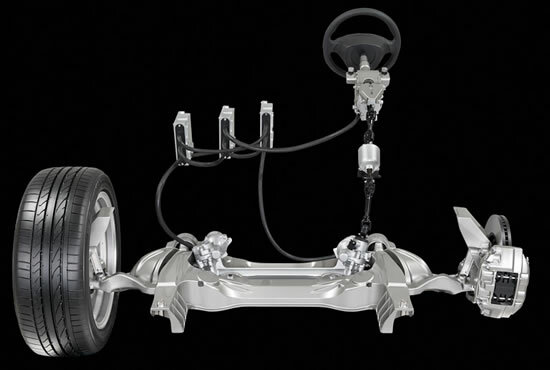 Accompanying this next-generation steering technology, Nissan has also developed a camera-based straight-line stability system to further enhance on-center driving capability. This system is a world-first technology that improves vehicle stability by making small input angle adjustments so the vehicle will accurately trace and continue as planned in the lane it is traveling. If the vehicle direction changes due to road surface or crosswinds, the system acts to minimize the effect of these conditions resulting in reduced steering input from the driver.